Mod The Sims - PETS owners: How to create BodyShop recolours compatible with older games. PETS owners: How to create BodyShop recolours compatible with older games. Replies: 58 (Who? ), Viewed: 83588 times. As discussed in THIS THREAD, several BodyShop items (namely, recolours of clothings and hairstyles, but possibly other BS stuff) created with the PETS BodyShop are not compatible with older games. On the other hand, BS items created with older games are compatible with Pets. In order to create a recolour that will work with any game, I suggest to use the new "Legacy BodyShop" included in the BaseGameStarter. This special verson of the BodyShop includes all the EPs that you have installed, except Pets. This way, you can create BodyShop stuff as if Pets is not installed, without actually uninstalling Pets. All the instructions for the Legacy BodyShop are explained in the BaseGameStarter thread, but for simplicity sake I'll sum up here the relefùvant info that may interest BodyShoppers. Download the BaseGameStarter, extract the installer from the zip and run it by double-clicking on the executable. In the first Option panel, select "Legacy BodyShop" (deselect all the other options if you are not interested). Skip the second options panel, just click "Next". Let the installer run its tasks, and you'll get a new icon "Start Legacy BodyShop" on your desktop: whenever you double-click it, the BodyShop will run ignoring the Pets EP, but including all the other EPs that you own. Anything you create with this BodyShop will not suffer from the problems created by Pets. When you run the Legacy BodyShop, all the sims-related windows must be closed, and be sure that the game, SimPE or HomeCrafter are not running. The Legacy BodyShop runs in a save folder of its own ("The Sims 2 - LBS"), that is completely autonomous from your main save-game folder ("The Sims 2"). Therefore, you have to manually copy the packages created with the LegacyBS to your main game, if you want to see them in the CAS. And the opposite, too: if you want to recolour a custom clothing, you have to copy it from your main game to the LBS folder, before starting the LegacyBS. What explained above will help you creating new BodyShop content compliant with all games. Last edited by tiggerypum : 24th Dec 2006 at 3:25 AM. Reason: bodyshop patch released! Looking for a forum to host your creations? Let's talk. PM me or email me from my site below. 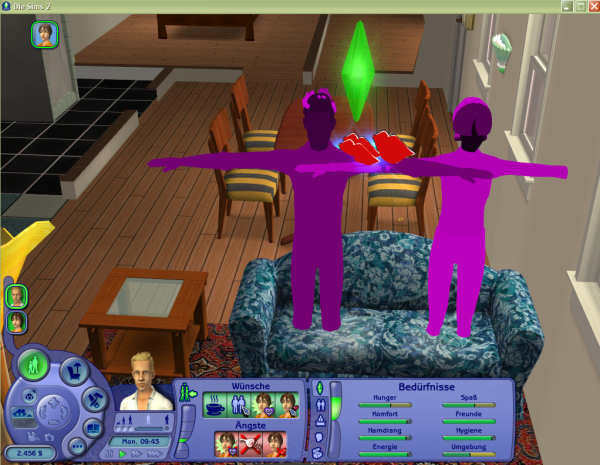 Check out Lucentsims :*) And our forums. Thanks! I've been having problems with Bodyshop a lot since Pets. Hopefully this will fix it! Numenor, this is GENIUS! I'd recommend Legacy BodyShop to every skinner, not just those with Pets. The ability to copy over and work with only the skins/meshes you want to for that session is such a relief! With the (probably) thousands of clothing textures, etc., that I have in my game (all of mine, plus so many others'), BodyShop was taking soooo long to load. LegacyBS opens in seconds! I am thoroughly thrilled with it! can i please know, right when i installed legacy body shop it removed my custom content? well i decided i want my custom content back and to remove legacy, how do i do that? i removed all the folders but when i open regular bodyshop my stuff is goine! how do i fix this? Visit my sims page:http://thesims2.ea.com/mysimpage/pod.php?user_id=851763 With it is downloads for all ages! Mmmhh... So, I gues you wouldn't agree with my idea to make the LegacyBS run in the same folder as the normal "main" game, right? Personally, I feel that EA's way ~ loading every single Sim-related file you have ~ is a terrible waste of time. People could just copy the custom meshes and skins they work with a lot, and leave those copies in the working folder. Then they'd only have to move the new files back to the playing folder. nnvp1, I hope you did not remove those folders with LBS running! The names of the folders are changed temporarily while LBS is running. You should find your downloads in the \Downloads folder, inside the folder named \The Sims 2 - FullGame, as long as LBS is running. Once you close LBS, that folder is renamed back to \The Sims 2, so you can play. Last edited by Hairfish : 17th Nov 2006 at 11:44 AM. I also prefer the way it is, with the separate folders so I can have only the meshes I want to work with and not have to go through so much stuff. But I can see where some people might prefer to have it use the same folders as the main game. I wanted to add a tip for people using this - your graphics editor will also "lock" the folders and make it impossible for the program to rename them properly if you leave it running when you quit BodyShop so be sure to close it BEFORE you exit from BodyShop. As for the choice between running the LegacyBS in a separate folder or in the main one, I was thinking... What about running the LegacyBS in a separate folder, like now, but - when the legacyBS is closed - automatically copying *all* the files in the legacy SavedSims, Downloads and Projects to the corresponding "fullgame" folder? You might think that overwriting the files in the fullgame folder is not a good idea, but if you would run the Pets bodyshop, your modification would overwrite the originals anyway, right? Last edited by Numenor : 19th Nov 2006 at 6:31 PM. Please forgive me if this is a senseless question, but couldn't I just use my OFB body shop to recolor my things? Would that also cause a conflict? I'm new to recoloring but it was suggested to me to use the OFB or Nightlife body shop. I've recolored many clothes and don't want to redo them. Thank you so much. My other favorite sites Spiffy Sims , Sims Fashion Barn and Betsys Little Sim Shoppes Great free downloads. but couldn't I just use my OFB body shop to recolor my things? If I understand S2 and Bodyshop correctly, every time you install a new exp the body shop is changed along with it, so you can't have OFB Bodyshop with Pets. Of course I could be talking complete and utter codswallop, as I can't even run Nightlife properly on my computer, never mind anything later than that! This message has been deleted by sbircead. Reason: Off topic.Posted in other place. I've been able to get the Legacy Bodyshop to work (thank you *so* much), and I've read the posts on how to fix clothing/accessories/skin tones made with the Pets Bodyshop so they are compatible with older EPs... but is there a way to make Sims that were packaged with the Pets Bodyshop compatible? I had a custom Sim whose face I spent a lot of time perfecting before I knew there were problems with Pets, and I'm really hoping there's some way that it will still be usable. The custom content on the Sim (hair/brows/skin tone) are all from pre-Pets, and those transfer over to the Legacy Bodyshop just fine, but I can't get the actual Sim with the new facial structure to show up, even using Clean Installer. Any suggestions are greatly appreciated! Sims 4 Rent - Sims 2 custom content inspired by the musical RENT! The BaseGameStarter NEVER deletes anything, so your game is still there for sure. If you have no errors, then the repair was successful: your game is again in the folder "The Sims 2". If you get an error, read it: it will give you instructions for solving the problems. Well, thanks anyway. It is just that I have recolored over 50 clothing items plus some eyes and other genetics. I did not want to go through 80 files changing each one. I was hoping that it was true about using another Body Shop. I deleted my Pets Body Shop and opened up the one from the OFB file. I only wanted to know if my clothes and other items would now work for people without PETS. Sky, try installing the basegamestarter. You can install a game that loads very quickly and you check to see if your items show up in a non-pets ep. huh? you dont get it , when i openes legacy , my downloads were gone right? so i look for them and they wernrt there! so i deleted ALL the legacy files hoping it would be there than is wasnt!then when i press sims 2 all i get is collections , logs, downloads and teleport?!!!! NNVP1: what folders do you have now in your (documents)\EA Games folder? If you have a folder named "The Sims 2 - FullGame", then all of your downloads (and the neighborhoods, the families etc.) are there. If you DON'T have a folder named "The Sims 2 - FullGame", but you have some folders named "The Sims 2 - CHECK_nn" or "Foldernn" (where nn is a two-digit number), look into them, in search of your "Full" game. 1) the folder contains a small file named "FullGame.id"
3) the folder contains a huge "Neighborhood" folder, with all the neighborhood you have played in the last two years. Again, the BaseGameStarter only renames the folders, it *never* deletes anything. And I'm sure you can't possibly have deleted by mistake a folder named "The Sims 2" or "The Sims 2 - FullGame". So, your "Full" game is still there, you just have to find it. If you want me to help you, then zip the entire "BaseGameStarter" folder and post it here. ...so I created a savedsims folder in the LBS folder and moved all my hair meshes over (about 150 or so) and I still get the same issue, about 6 meshes show up in all female age groups. Are you sure you copied/moved at least one texture for every mesh? Are you looking in every color bin?